There’s nothing quite like the memories that can be made with your family while you’re out on the road. Cruising to the lake, darting to the next practice, or running to the grocery store, the right vehicle can foster a fun environment to make every drive enjoyable. 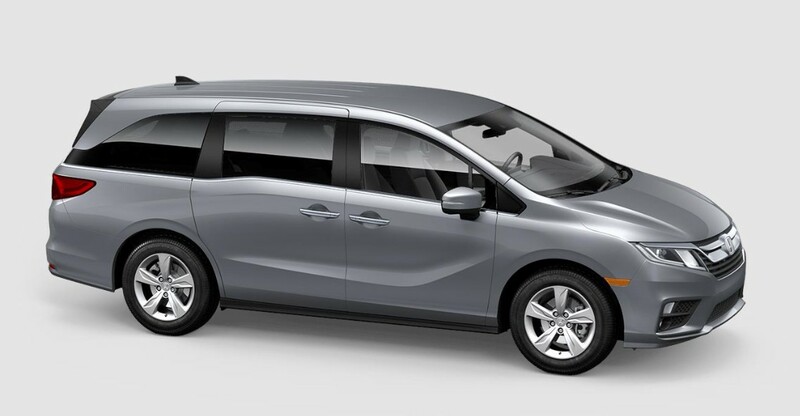 Such a vehicle is the 2019 Honda Odyssey EX for sale in Fontana, CA. This minivan is packed full of great features that make family ventures better. If you are looking for your next family vehicle, come visit us at Rock Honda and test drive a 2019 Honda Odyssey EX near San Bernardino, CA. Our friendly sales people will help your family pick out the best van from our large 2019 Honda Odyssey inventory near San Bernardino, CA. We’re located in Fontana, CA and have served families from the surrounding areas near Rancho Cucamonga and San Bernardino, CA. With a stunning new design, the 2019 Honda Odyssey EX in Fontana, CA looks fantastic cruising down the road. The side of the van features swooping lines, the roof appears to be floating, and LED elements in the headlights and taillights look brilliant. The style isn’t just for show, however, as the design helps it cut through the air efficiently and reduces wind noise in the cabin. Speaking of the cabin, the 2019 Honda Odyssey EX is the perfect place for families. To start, you access the cabin with standard power sliding side doors then you find plenty of seating for seven people. The back seats feature Honda’s innovative, and appropriately named, Magic Slide 2nd-Row Seats™ that allow the seats to slide side to side to create easier access to the third-row or create some extra space to foster sibling diplomacy. Up front you’ll have plenty to keep you entertained when driving around in the Inland Empire with an 8-inch touchscreen infotainment system, Apple CarPlay™, Android Auto™, plus front and rear USB charging ports to keep everyone’s devices charged. Keeping everyone comfortable is a tri-zone climate control and heated front seats. In the engine compartment, the 2019 Honda Odyssey EX comes packing a 3.5-liter V6 engine producing a healthy 280 horsepower. Managing the engine’s power smoothly and efficiently is a nine-speed automatic transmission. Safety is obviously a concern for families, so the Odyssey comes with Honda Sensing® which is a suite of safety technology including things like Collision Mitigation Braking System, Adaptive Cruise Control, and Lane Keeping Assist System. The systems aid the driver and help make every drive a little safer. Ready to test drive? Visit us here at Rock Honda in Fontana, CA to learn more!